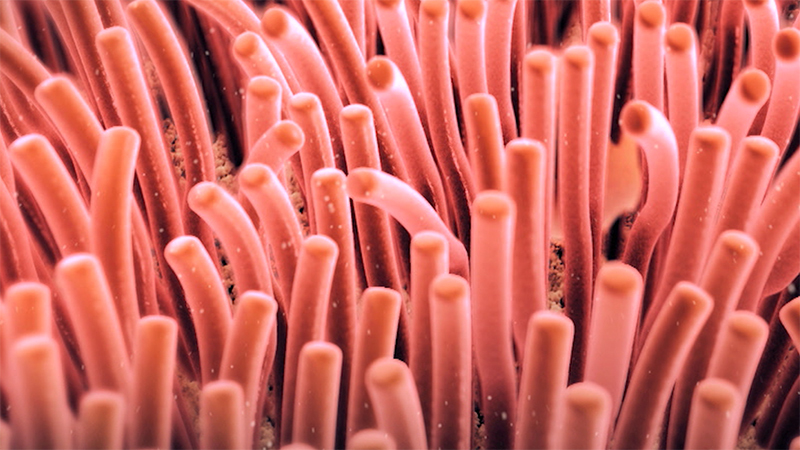 Tiny, hair-like projections from the surface of a cell that wave in unison to cause movement. Tiny, hair-like projections from the surface of a cell that wave in unison to cause movement. Our airways are lined with cilia, which sweep dust and other particles away from the lungs, protecting them from infection. Some single-celled organisms use cilia to move themselves around. The cilia act like tiny paddles, enabling the organism to propel itself through liquids such as water. Our airways are lined with cilia, which sweep dust and other particles away from the lungs, protecting them from infection. Some single-celled organisms use cilia to move themselves around. The cilia act like tiny paddles, enabling the organism to propel itself through liquids such as water.